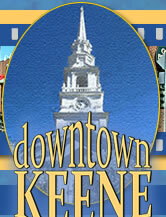 With the wide variety of restaurants available in downtown Keene, you can be certain of finding a great meal. Whether you are looking for an exquisite dining experience, a quiet place to relax and unwind with friends or something quck and easy before a show, downtown Keene restaurants are the place to dine! Fireworks Restaurant, 22 Main Street, Keene, NH 03431. (603) 903-1410. Fritz Belgian Fries, 45 Main Street, Keene, NH 03431. (603) 357-6393. Keene Fresh Salad Company, 44 Main Street, Keene, NH 03431. 603/357-6677. Lindy's Diner, 19 Gilbo Ave., Keene, NH 03431. (603) 352-4273. The Stage Restaurant, 30 Central Square, Keene, NH 03431. (603) 357-8389. Timoleon's Restaurant, 25-27 Main Street, Keene, NH 03431. (603) 357-4230. China Wok, 7 Court Street, Keene, NH 03431. (603) 352-2808. King's Garden Chinese Restaurant, 88 Main Street, Keene, NH 03431. (603) 357-0364. Thai Garden - Exotic Thai Cuisine, 118 Main Street, Keene, NH 03431. (603) 357-4567. Outstanding selection of authentic Thai cuisine. Also offering take out service. Tony Clamato's Ristorante, 15 Court Street, Keene, NH 03431. 603/357-4345. Luca's Mediterranean Cafe, 10 Central Square, Keene, NH 03431. (603) 358-3335. Come in and let us take you on a culinary journey through the Mediterranean! Enjoy the flavors of France, Italy and Spain. Reservations are welcome. Come and enjoy the experience of Luca's Mediterranean Cafe. Armadillo's, 82 Main Street, Keene, NH 03431. (603) 358-3700. Margarita's, 77 Main St., Keene, NH 03431. (603) 357-4492. Pedraza's Mexican Restaurant, 45 Central Square, Keene, NH 03431. (603) 352-3199. The Pour House, 44 Central Square, Keene, NH 03431. .
Kali's Sports Pub, 151 Main Street, Keene, NH 03431. (603) 357-2800. Kilkenny Pub, 82 Main Street, Keene, NH 03431. (603) 357-6669. McCue's Billiards & Sports Lounge, 12 Emerald Street, Keene, NH 03431. (603) 352-2110. Railroad Tavern, Railroad Square, Keene, NH 03431. (603) 357-0098. 21 Bar & Grill, 21 Roxbury Street, Keene, NH 03431. (603) 352-2021.